You thought I was done with Japan? Nope! I’m just bad at prioritizing topics, it tends to happen when you accept too many blogger gigs you know. So anyway, this time let me talk about Osaka, the points of interest that you can see, food spots where you can eat, accommodation where you can sleep, among others. But first where is Osaka? Osaka is the second largest metropolitan area in Japan (the first one is Tokyo) and previously, it goes with the name, Naniwa. It is a large port city and commercial center on Honshu island. The people here are polite and disciplined, the streets are spotless, the infrastructures are modern and impressive. Most especially, it’s the ultimate foodie destination. Are you planning to go to Osaka? Here comes an easy guide to exploring this marvelous city. 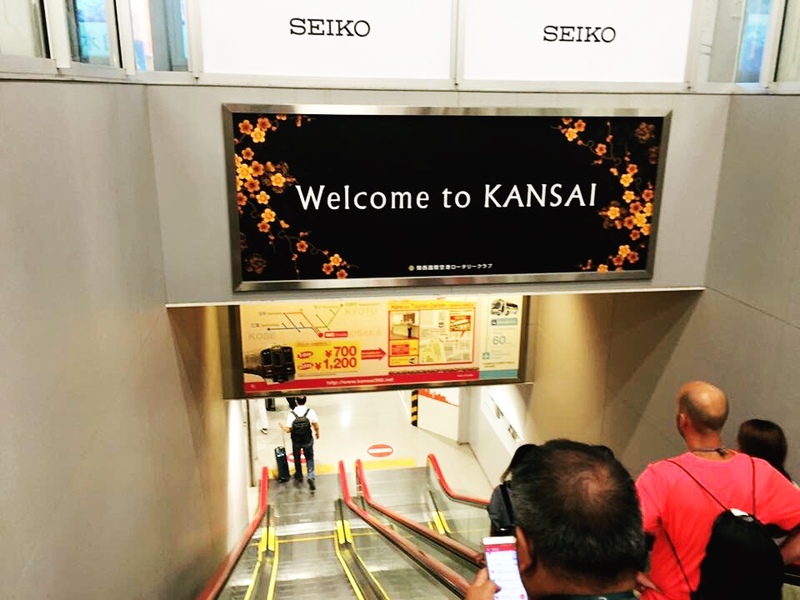 There are two airports that serve as the entryway to Osaka, Kansai International Airport (KIX) and Itami Airport (ITM). 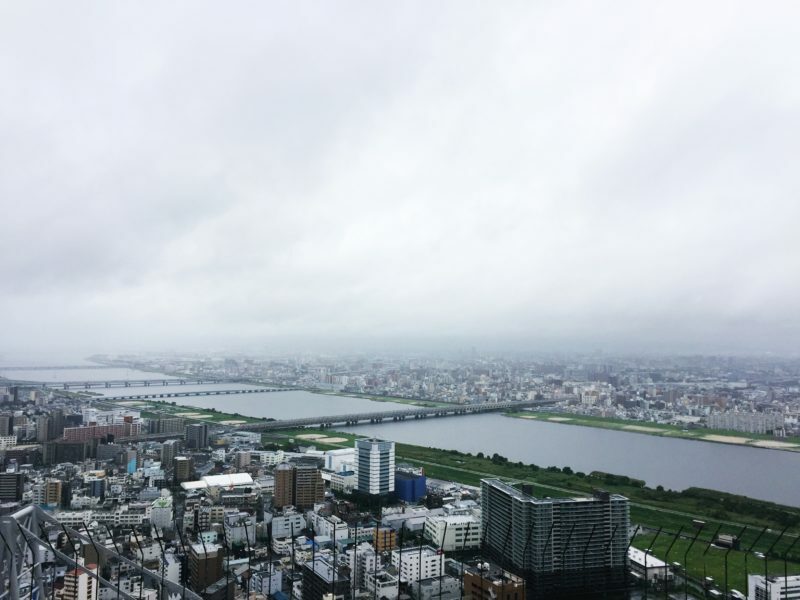 ITM is located in the north of central Osaka and handles domestic flights to more than 30 destinations in Japan. If you’re coming from another country though, your point of entry is KIX, which is on a manmade island, about 40 kilometers south of central Osaka. Cebu Pacific, the largest airline in the Philippines. Cebu Pacific flies between Manila and Osaka five times weekly, with lowest year-round fares starting from PHP6,399. Cebu Pacific also flies from Manila to Tokyo (Narita), Nagoya and Fukuoka, as well as from Cebu to Tokyo (Narita). Book its trademark lowest fares now through CEBsakaflights or (+632)7020888, or follow its Facebook or Twitter pages for the latest seat sales. 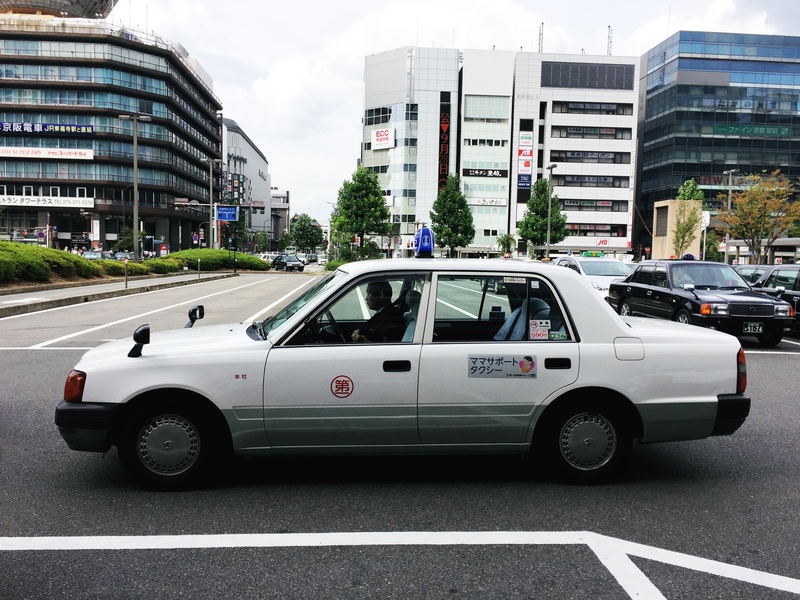 There are two major mode of public transportation in Osaka, train and taxi. The vintage-looking taxis are driven by senior drivers who are impeccably dressed it would make you feel like you have a personal chauffeur. Taxi fare starts from JPY 600-700 (PHP 200-300/USD 5-6). Majority of the Japanese do not speak in English including the cab drivers so communication might be a little challenging. Tip: Keep a notebook or paper with a list of basic Japanese phrases, complete with one written in Japanese characters. This proves to be helpful when communicating with non-English speaking locals. Do you understand English? Eigo wa wakarimasu ka? 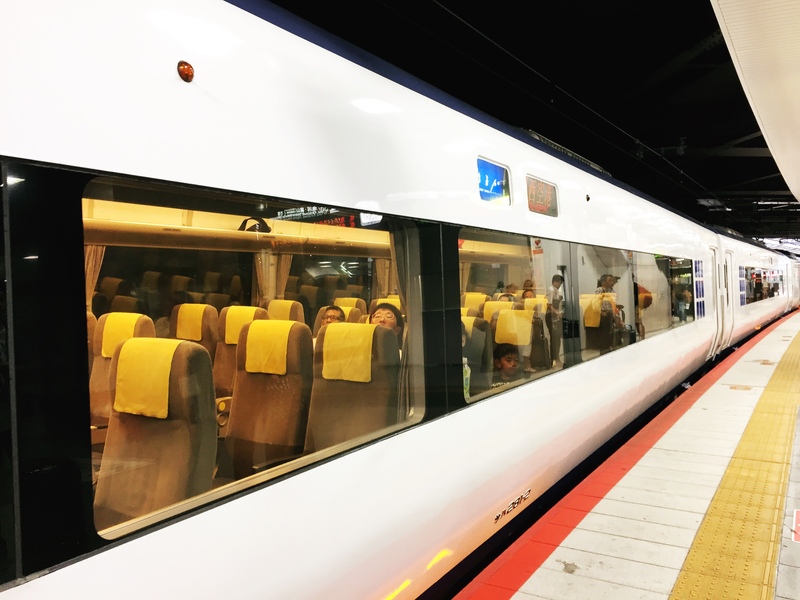 The cheaper alternative is to ride the train especially if you are planning to visit the nearby cities like Kyoto. To know more about Japan Rail Pass, click here. Now that you’re settled it’s time to explore Osaka. Here are list of tourist spots that you shouldn’t miss during your visit. Universal Studios Japan or USJ can be found in Konohana-ku, Osaka. 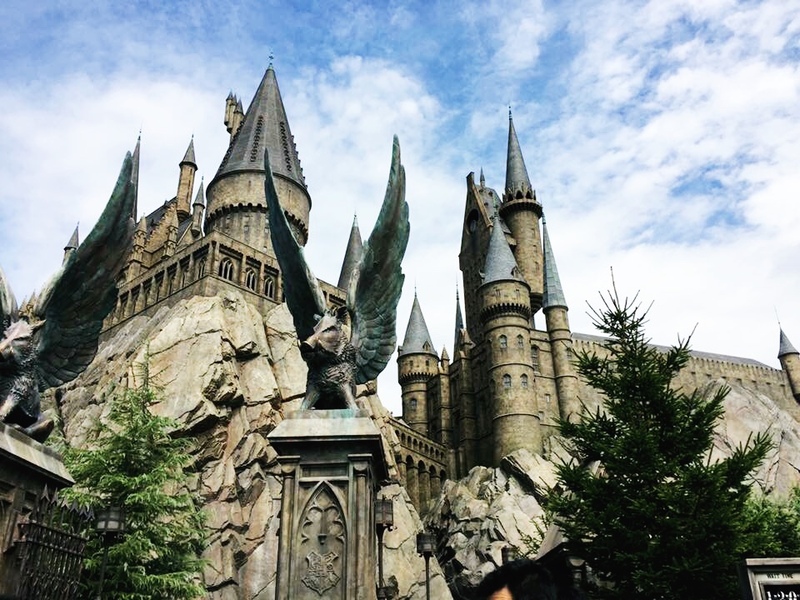 It’s a theme park filled with exciting attractions, the most popular of which is the Wizarding World of Harry Potter. To know which rides/attractions you shouldn’t miss when visiting USJ, click here. Umeda Sky is a building that stands at about 173 meter tall. It has two towers linked together by a floating garden observatory. Going up here has been a little challenging for me given my fear of heights. The elevator ride alone, which by the way is made of glass, almost gave me a heart attack. 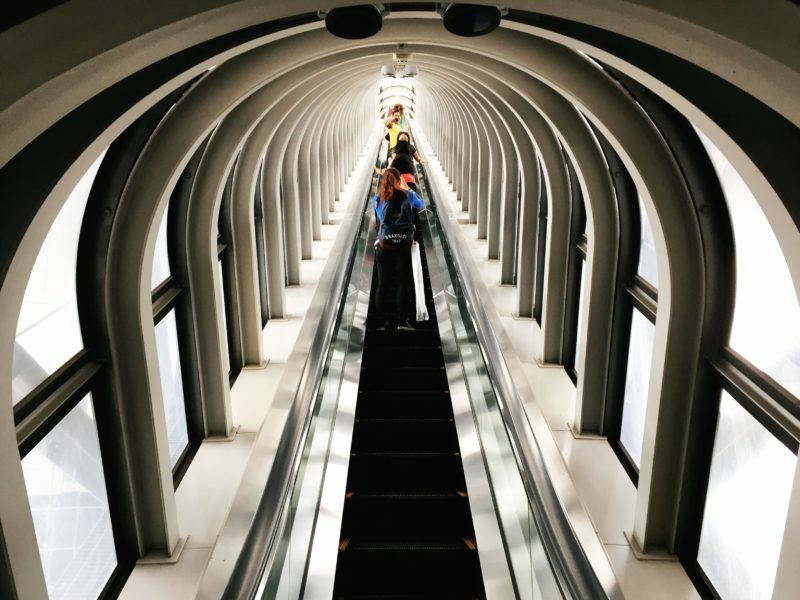 I almost booked it when I found out that we still had to take an escalator, but my fellow bloggers wouldn’t let me go off easily haha… With the help of Gael (Thepinaysolobackpacker), I took the paralyzing escalator ride. For some reason though, once I reached the top the fear was gone. 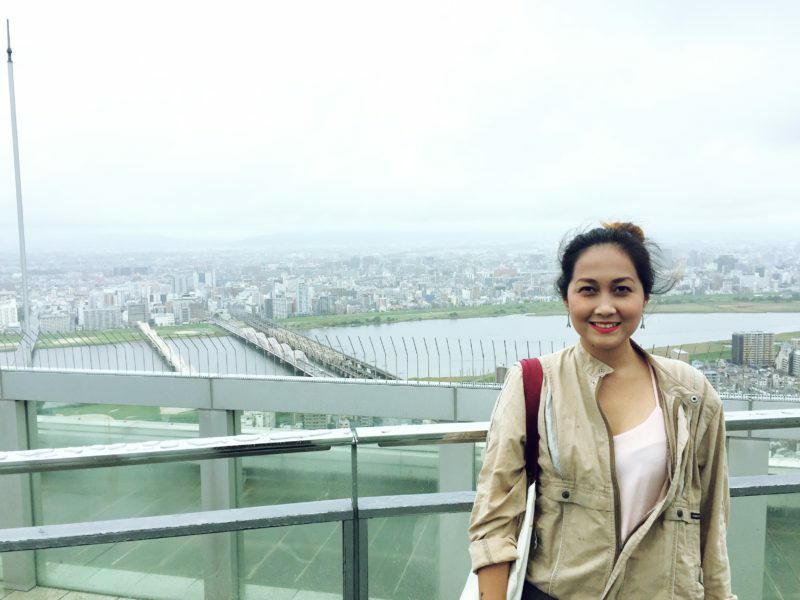 So I was able to go all the way to Sky Walk where I enjoyed the fantastic 360 view of Osaka. Yes, I made it! I don’t know about you, but one of my favorite activities whenever I travel aside from eating is shopping. And in Osaka, shopping is synonymous to two places: Shinsaibashi and Dotonbori. 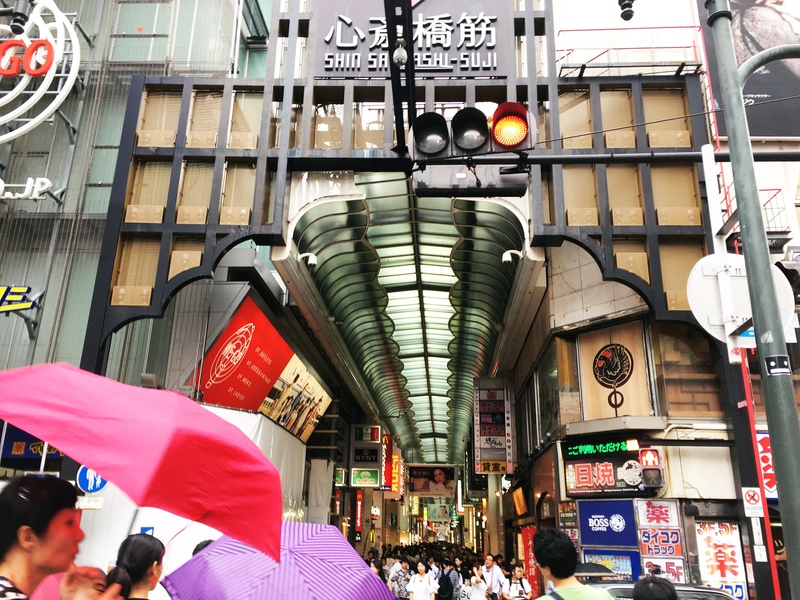 Shinsaibashi is a 600-meter stretch of shopping area where you can find chain retail stores and fashion boutiques. It reminded me a little bit of Divisoria albeit a much cleaner and expensive version. Famous retail-clothing companies, such as H&M, Uniqlo, and Forever 21 have their outlets here. In my case, I was able to buy a cute brown sweater from a Japanese brand, GU. I was completely stumped when it was time to make the purchase because they use machines instead of humans to accept payments. 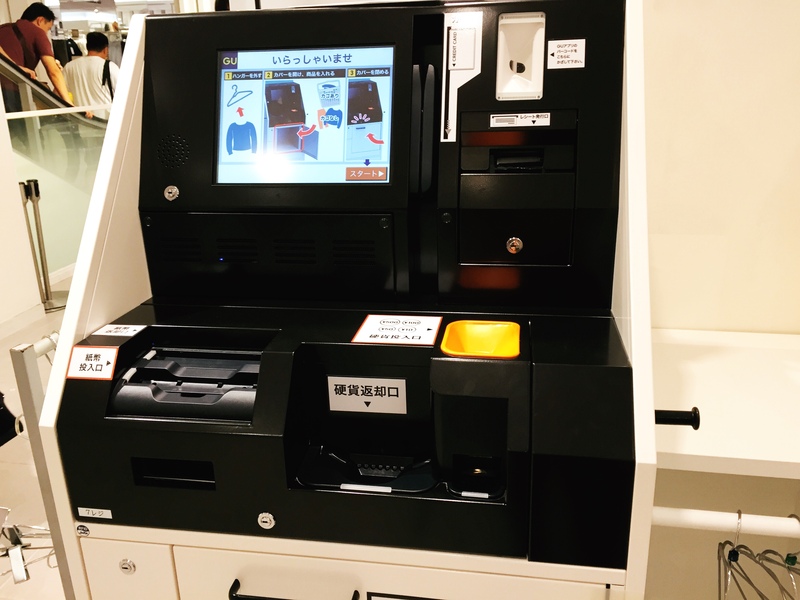 The instructions on the machine itself was also in Japanese so I couldn’t proceed without asking for some assistance from one of the staff. Honestly though, you pay through a machine? How awesome is that?! Japan is indeed full of surprises. Note though that some of the stores have tax-free items while some are not. If you are not sure, ask the staff. I honestly didn’t notice that I’d been to Dotonbori until I look at the photos that I’d taken on my phone. Dotonbori is adjacent to a canal and the street is lined with food, shopping, and entertainment establishments. 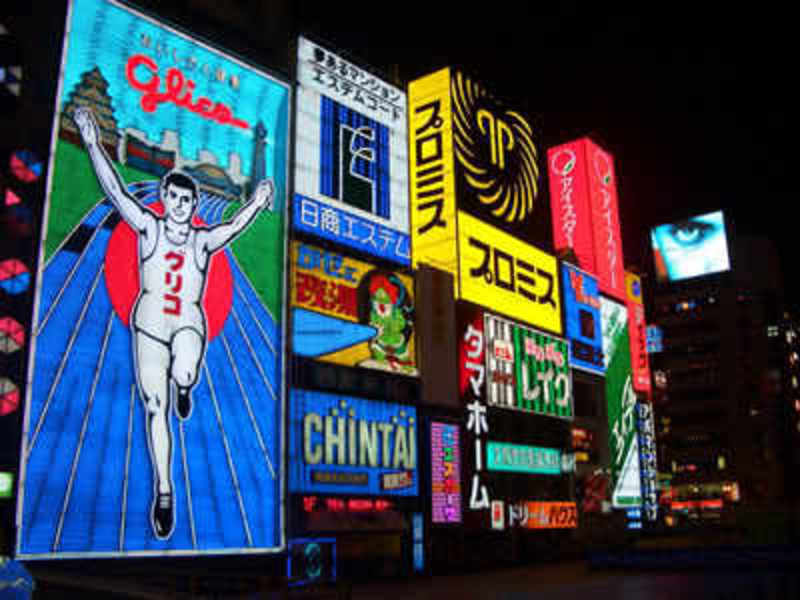 Its most famous landmark is the Glico Man. When you go to Dotonbori, drop by at Don Quijote if you want to shop for inexpensive souvenir items. It’s a tall building that is a popular discount store in Japan. In the Philippines it can be likened to a department store. You can buy anything here, from matcha-infused food, toiletries, beauty products, gadgets, groceries, even home appliances. This is where I got the souvenir (pasalubong) stuff that I took home for my family and friends. Osaka was the center of rice trade during the Edo period, gaining for itself the title, the Nation’s Kitchen (tenka no daidokoro). 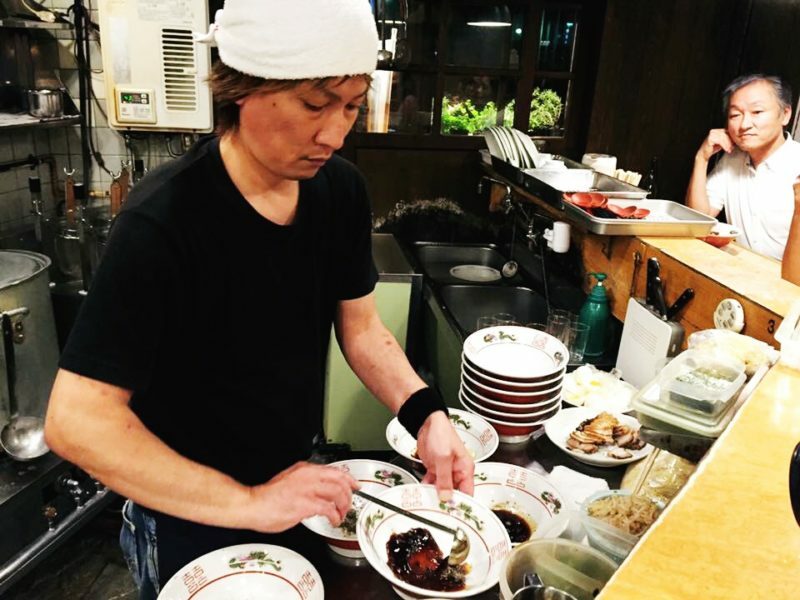 Today, Osaka is one of the best spots in Japan for some serious gastronomic exploration. 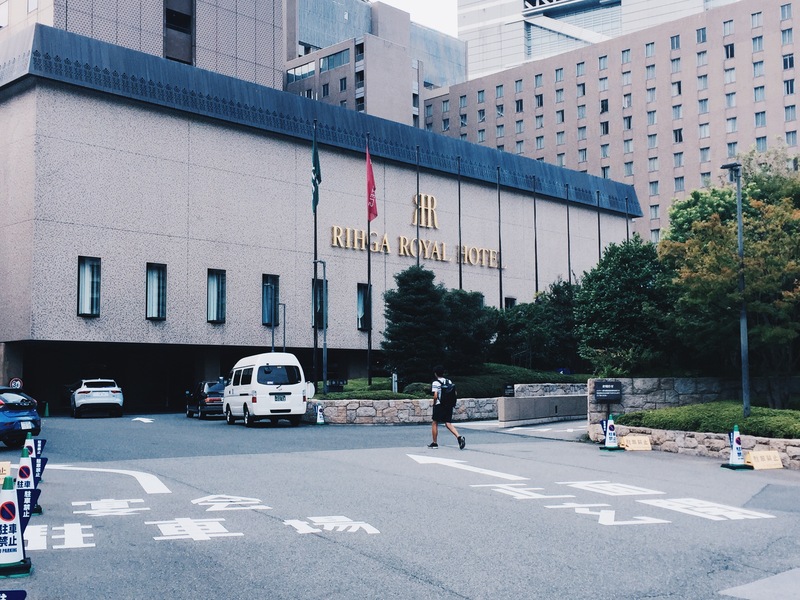 If it’s buffet that you are looking for head on to Righa Royal Hotel where you can find one of the best buffet restaurants in Osaka. 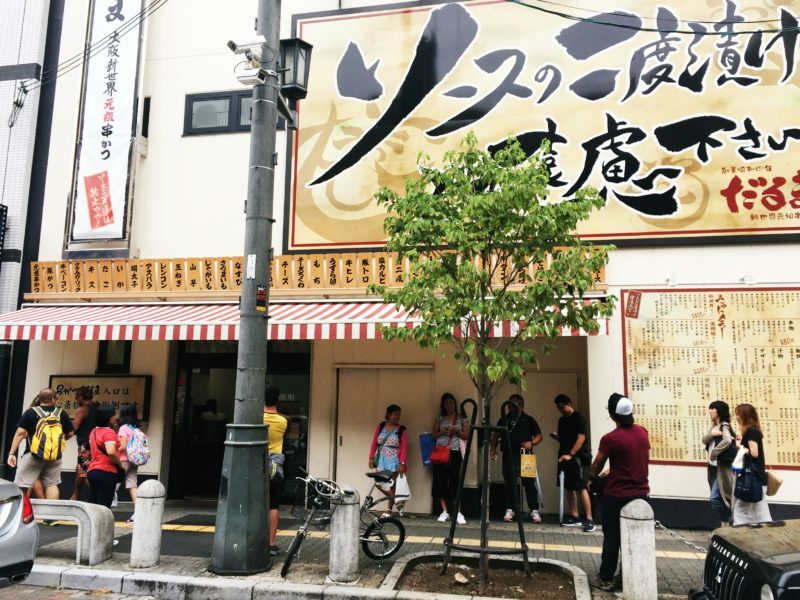 For good ramen, go to Yatai Marutoku Ramen. 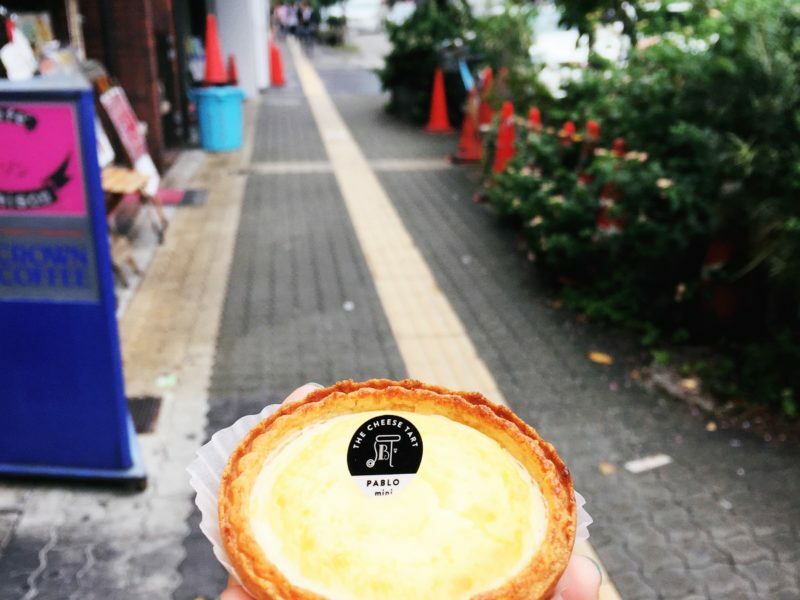 When you go shopping along Shinsaibashi area, try the famous cheese tart of Pablo. And when you go to Universal Studios Japan (and I highly recommend that you do not miss it), try the food that our group enjoyed inside. 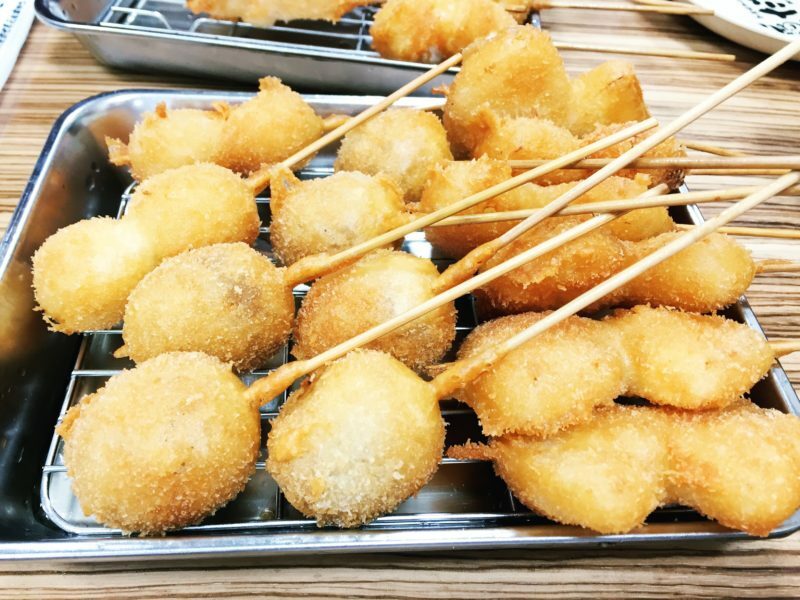 Click here to see my food recommendation at USJ. Oh Japan! The most awesome country I have been to as of writing. Iba tlga sa Japan hhehe! The trip of yours was really nice! We went shopping on Don Quijote where most of the cheap goods are. Unfortunately, we weren’t able to go to the Umeda Sky Building. Masyado na gahol sa oras. hahaha! Sayang! In India, we have begun having cashless payments. Or rather, less cash payments. So, I was not surprised when you showed pictures of that machine. That way, there is less corruption, I guess. Japan! So far from Greece! I have beem working for a while with Japanese people! They were very polite indeed! I like the fact that you included some basic phrases. I tried to outspeak them…it was so funny,I couldn’t! I know for sure that the air fares from Greecr are super expensive! So kind of you not just to include hotel accommodations but basic Japanese phrases. These are helpful words to communicate with them especially that you’ve mentioned most cab drivers are not so fluent with the English language. I hope to.visit Japan someday. And these tips will surely be of big help. Konichiwa!! Even, Nihongo ga wakarimasen! Arigatou, for posting that translation. That could really come in handy if one is looking to travel to Japan. I’m quite amazed by the cleanliness. Even a concrete jungle looks so beautiful that way. To be able to go to Japan one day is an impossible dream for us now. We know a Japanese friend who lives in Tokyo and if we ever are able to go to Japan, he’ll be one of the first people to know. lol. Next year, I’ll have my very first out of the country visit and I have a mix of excitement and worrisome. I now realize how challenging the communication might be. But I bet we’ll make it. This is a such an informative guide! I love Japan is one of my favourite countries- I have been to Osaka 3 times and still haven’t been to Universal studies! Love love love the floating garden though- has some amazing view! PS I am totally the same when it comes to prioritising topics! Haha I still have a couple of posts from Japan last year that I am yet to publish! Thanks for the heads up about the language barrier there. I faced exactly the same issue in China (yeah, got a bit cheated with money too!). My friend is travelling to Osaka this year, so I’m gonna share this with him. Japan Rail Pass sounds like an interesting option. I love public transport anyday to taxi, you know it gives the actual feel of the city!!! Btw, Congrats on being invited by Cebu Pacific! Wow! Osaka is one on my bucket list! Glad to read about this. This is very helpful for future reference. What excites me about Japan was the place where one can buy pre owned designer bags at a very low price. Have you checked it? Yay! A friend told me they went there and its a mecca for everything branded yet cheap. I think shopping excites me more than the tour. Lol! Japan is just so full of wonders! I’ve been to Tokyo but I haven’t had the chance to explore Osaka. I think I would like to visit the Umeda Sky Building. 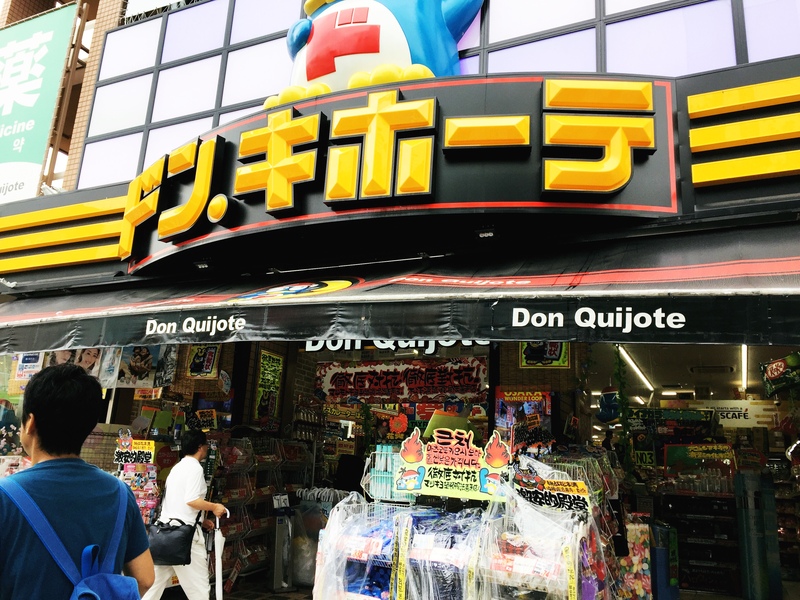 I also went to Don Quijote in Tokyo, and I must say it’s my favorite store in Japan. So quirky! Haha! Very detailed post and helpful especially for Japan first-timers! This is such a comprehensive yet succinct guide to Osaka, just the kind of travel blog posts I love to read. I didn’t know realise there was a Universal Studios in Japan, I love theme parks, visited Orlando last year so I would love to go to the one in Osaka to compare them – another one for the bucket list! Great guide! There are so many places in Japan that I would like to visit and Osaka is definitely one of the cities. The list of Japanese words to carry around is definitely handy to have. When I go I want to focus on food! Though I had known that Japan is quite a popular destination for its bamboo forests and cherry blossoms. Didn’t quite know there were many more interesting locations to explore. Osaka seems to be an amazing destination by itself. Love the pictures in this post. 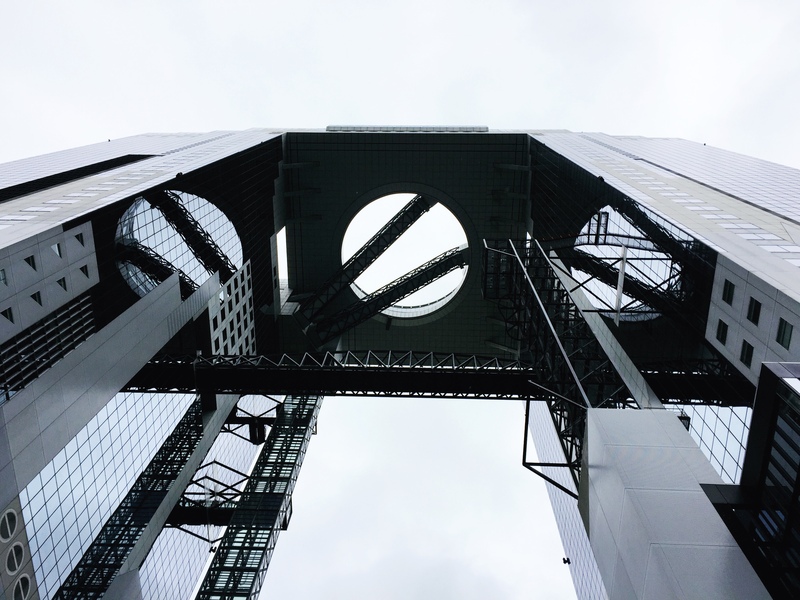 Especially the pic taken of Umeda Sky from below. I’ve always wanted to go to Japan. I think the fact that they have a Harry Potter World has just clinched it for me. That’s so cool, I’m a huge fan. This post is so detailed and helpful if I ever decide to go there. thank you so much for putting it together! I didn’t stop off in Osaka when I traveled to Japan this year, and kind of regret it. Especially given that the Universal Studios are there! Umeda Sky pala ang name. I was wondering what that building was you used for the featured image. Anyway, I thought the architecture looks really nice. For some reason, I am thinking that the architect must have thought about photos being taken from the ground and took that into consideration sa pag design. I have heard so much about Osaka and how the food there is not expensive, contrary to popular perception that everything in Japan is. As for the hostels, I also heard that even hostels are really nice and has a classy feel. The food photos make me want to hop on the next flight! Great and detailed guide! I was also amazed when I saw a self service counter at one of the supermarkets in Minnesota, you can even pay in card and sign right there! I would love to visit Umeda Sky if I go to Osaka! That would be exhilirating! 8D Congrats from braving the tower!